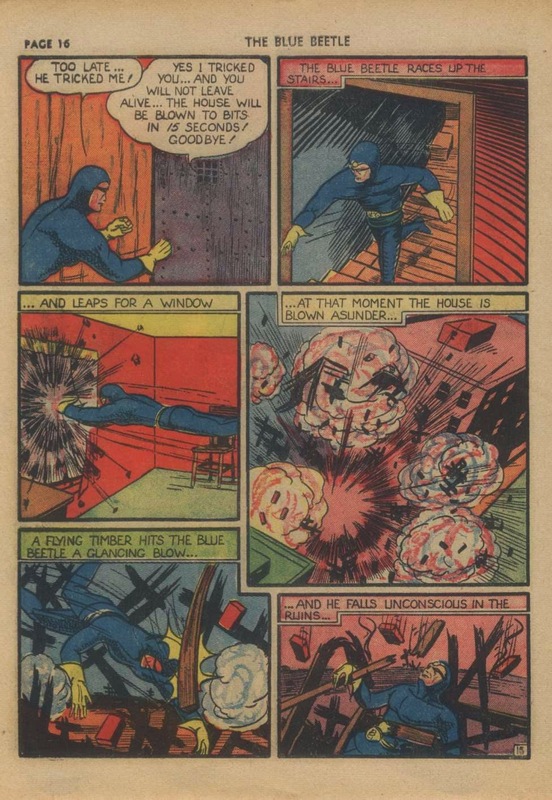 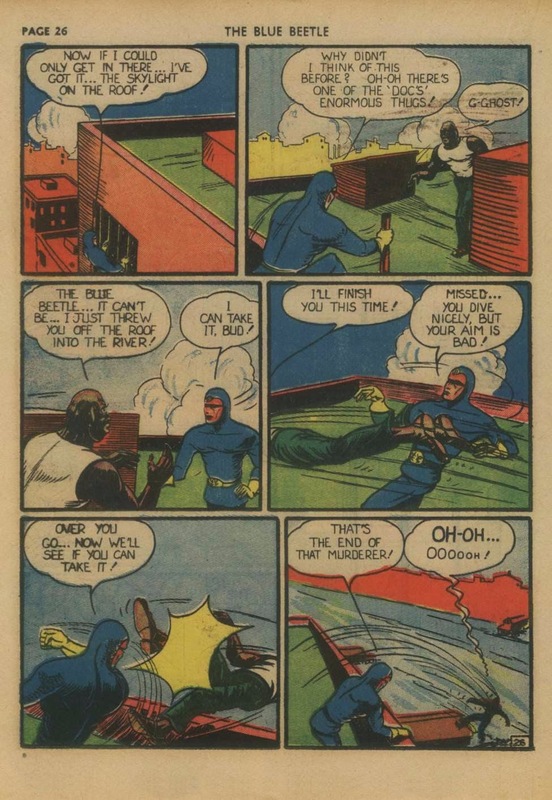 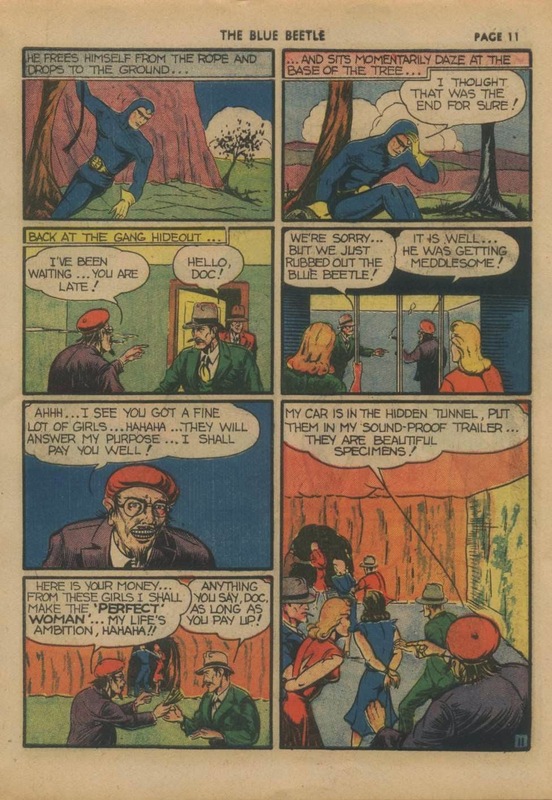 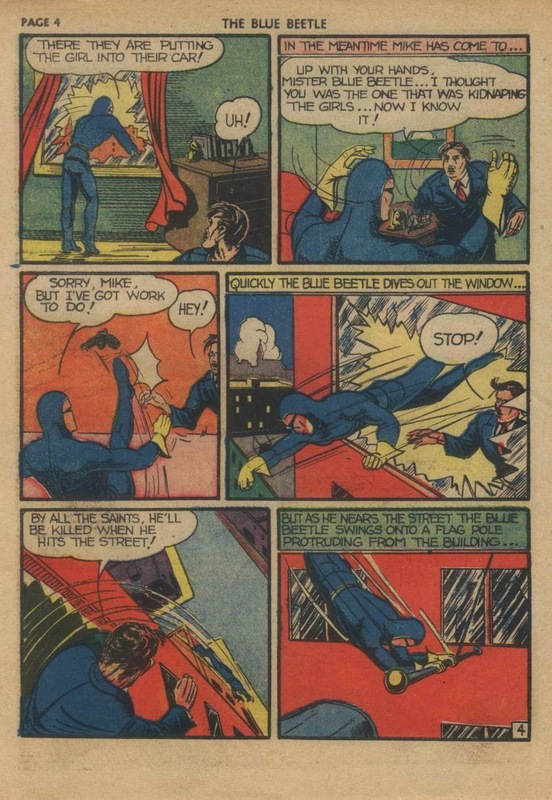 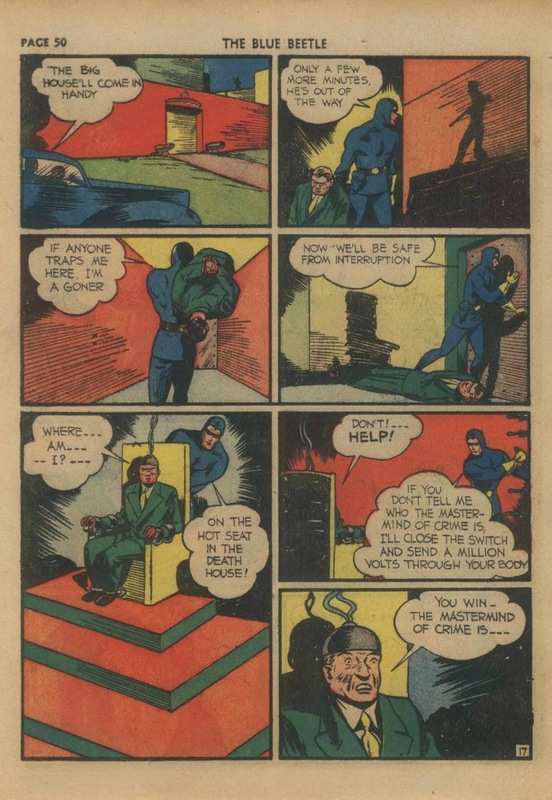 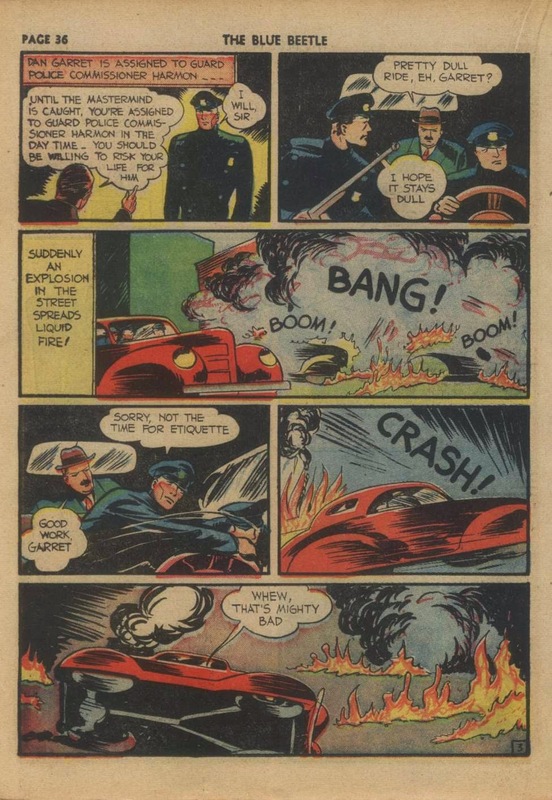 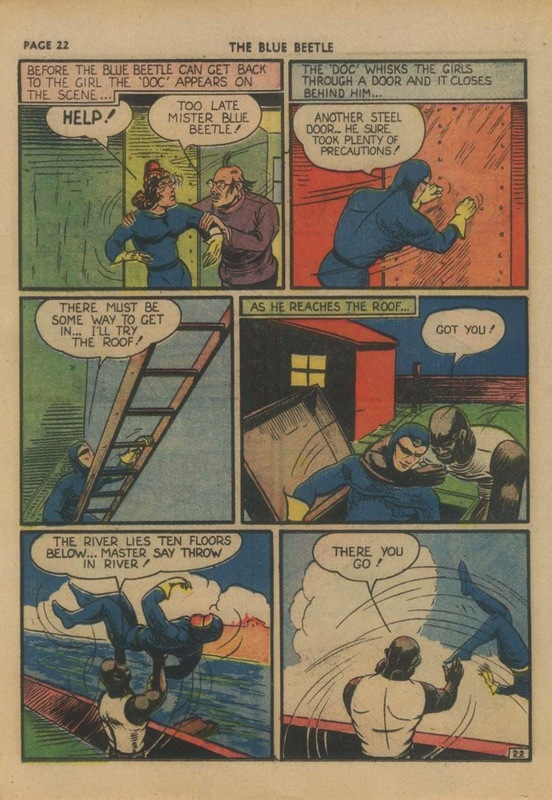 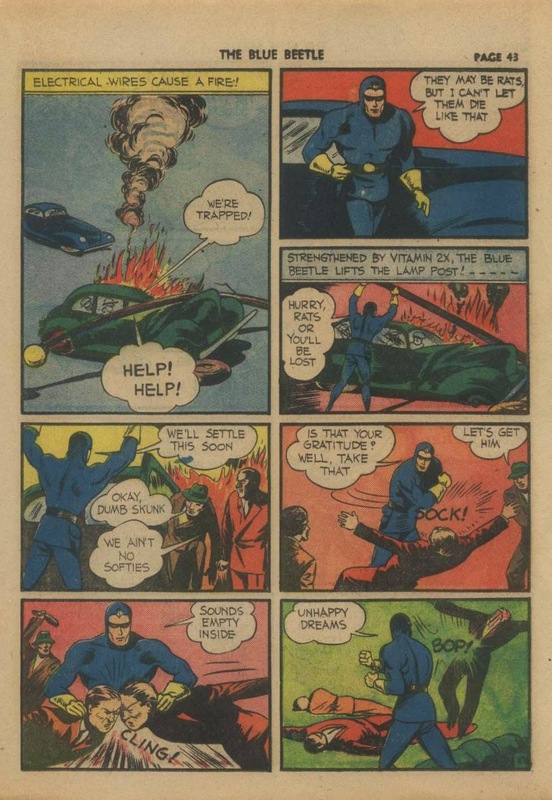 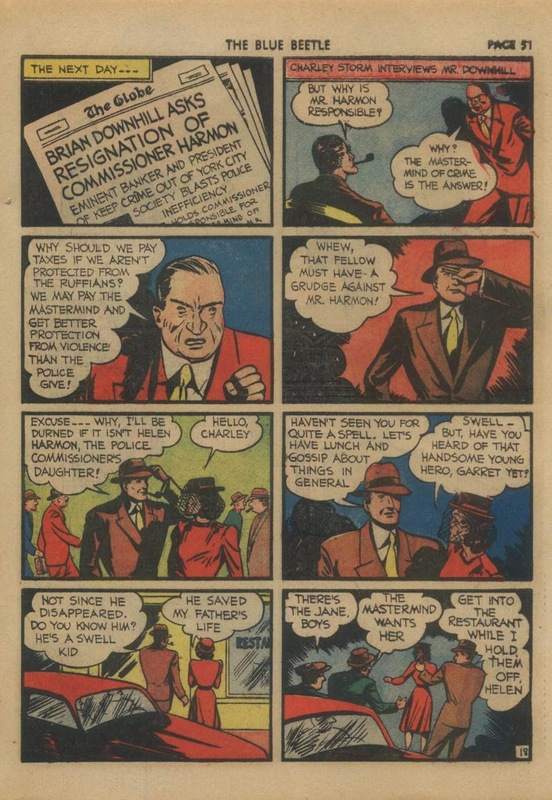 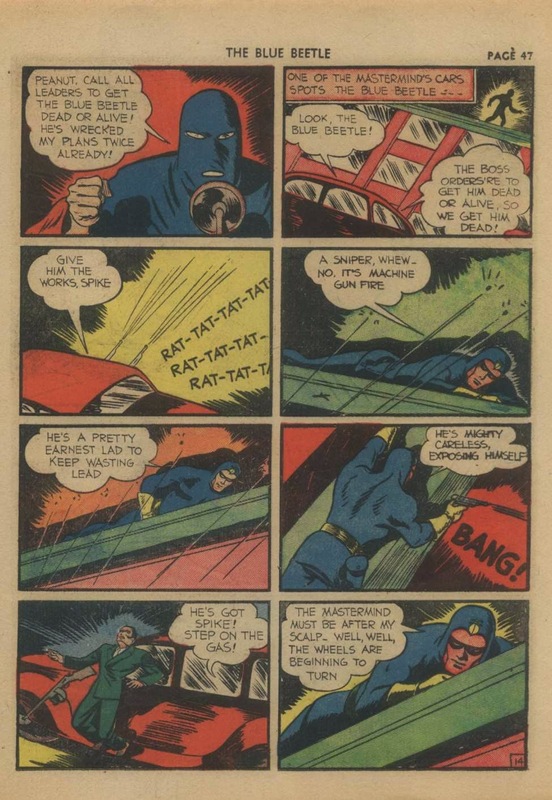 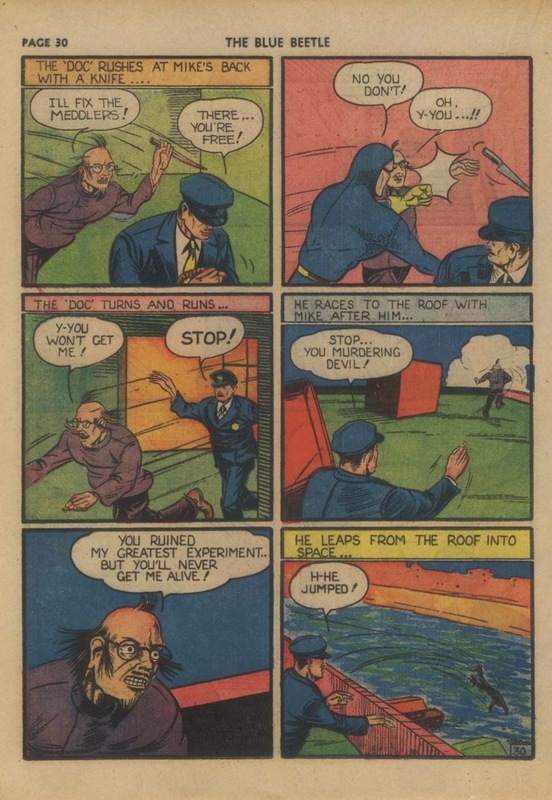 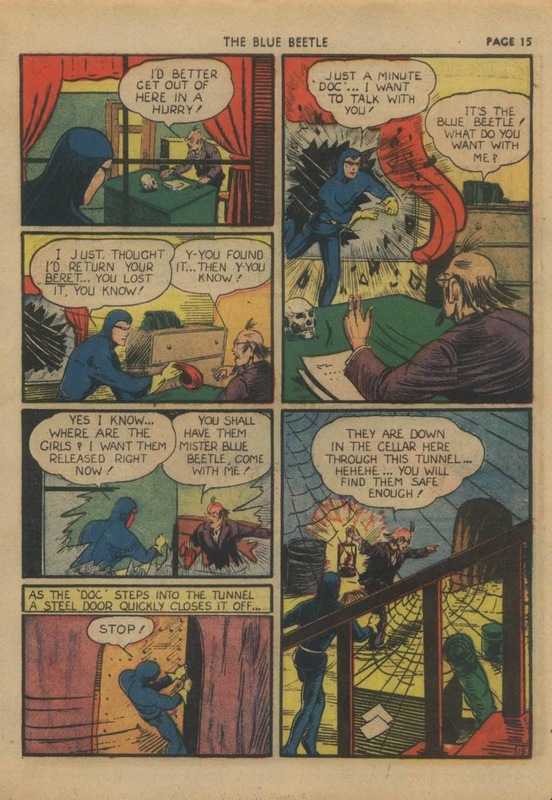 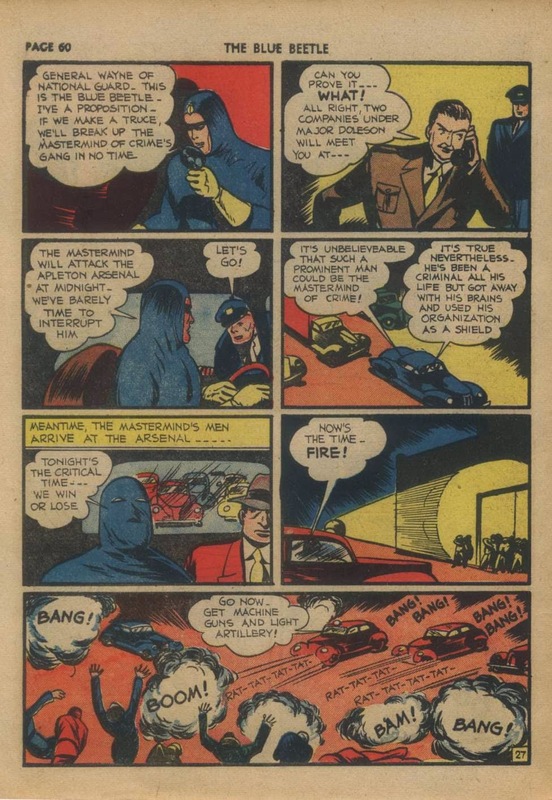 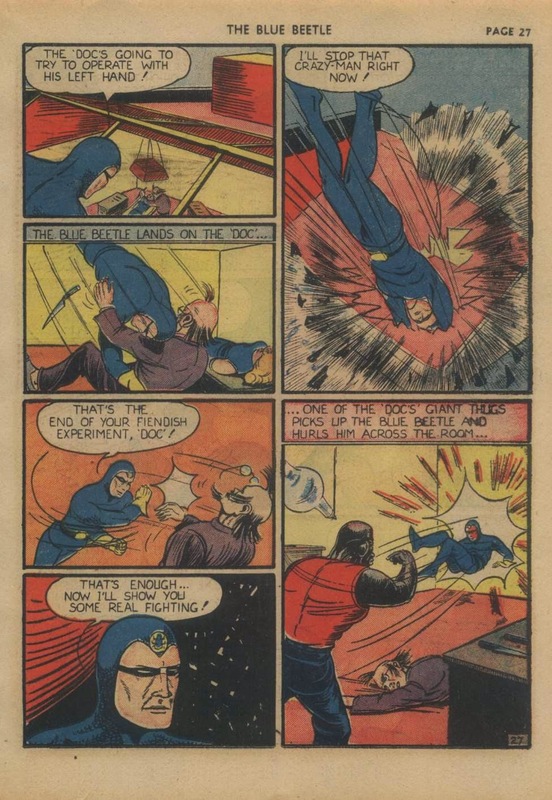 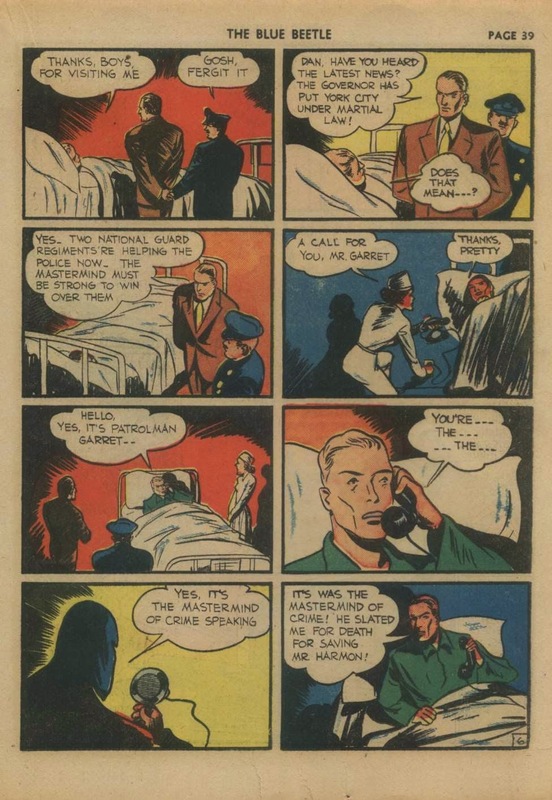 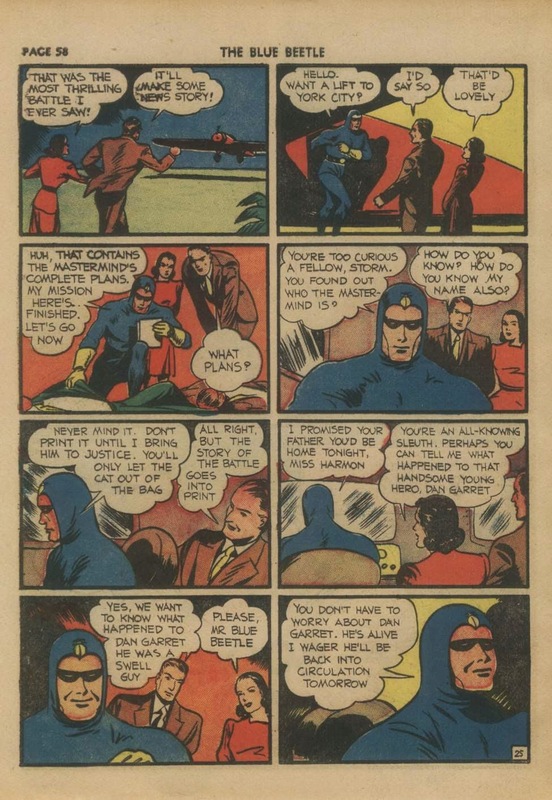 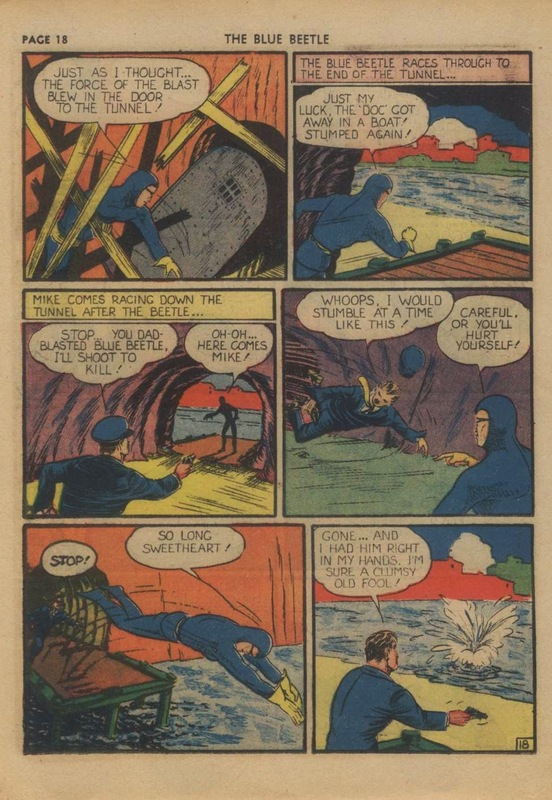 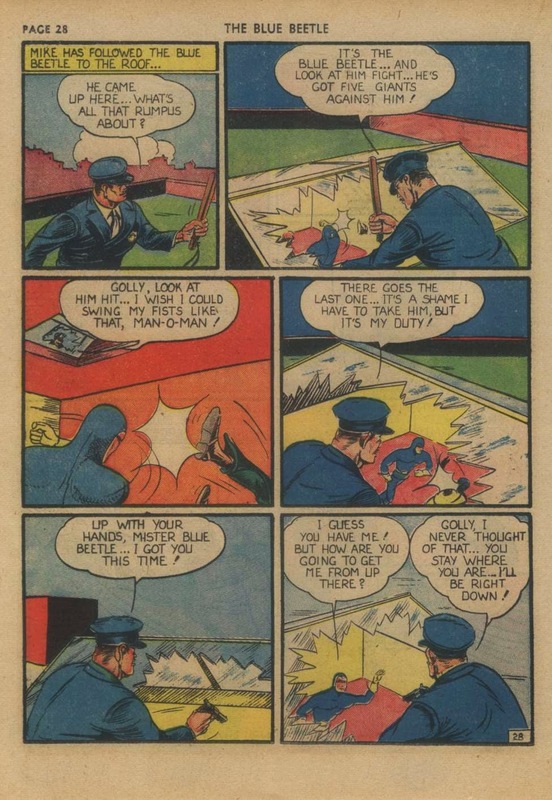 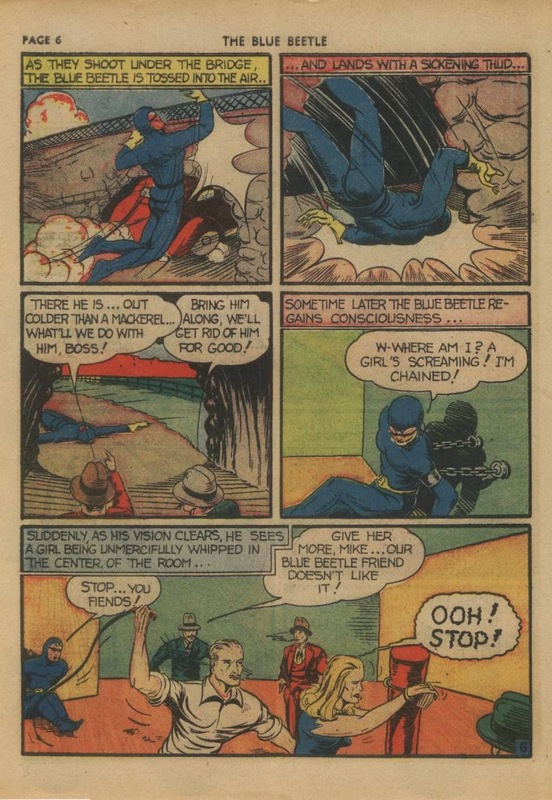 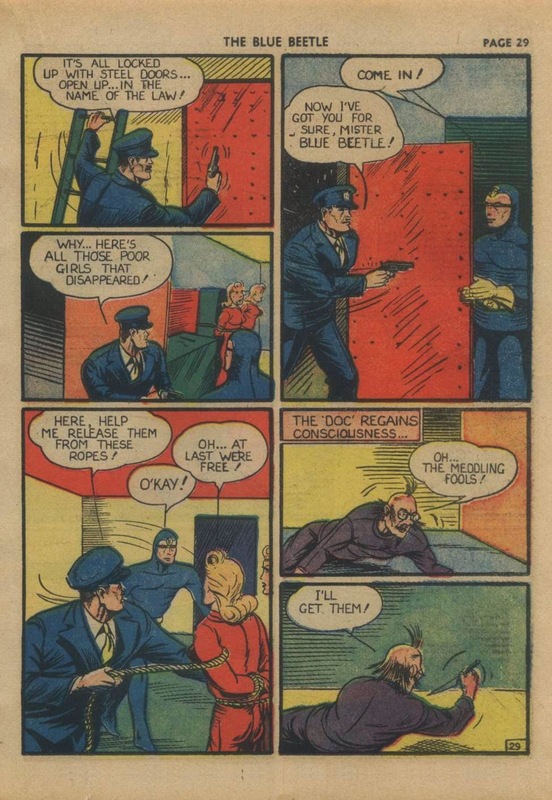 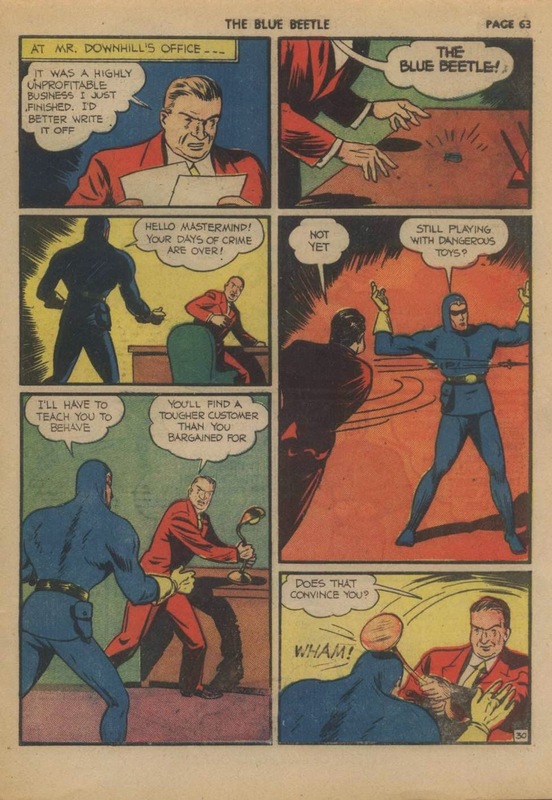 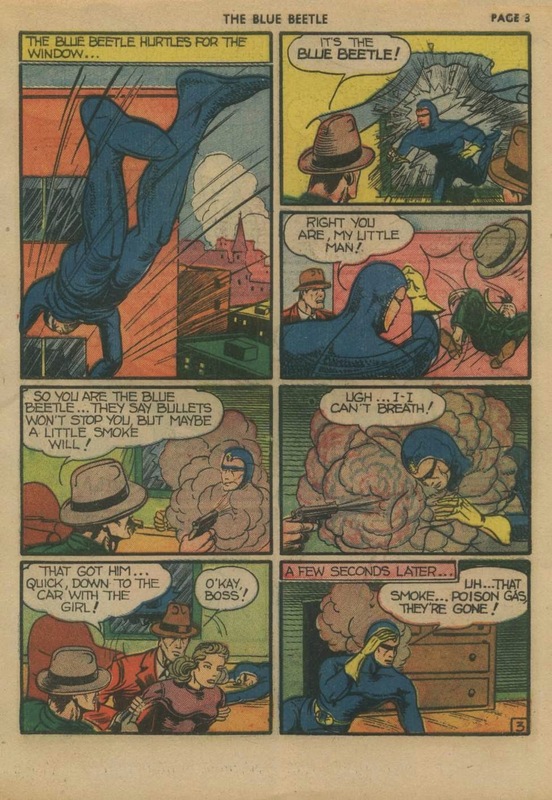 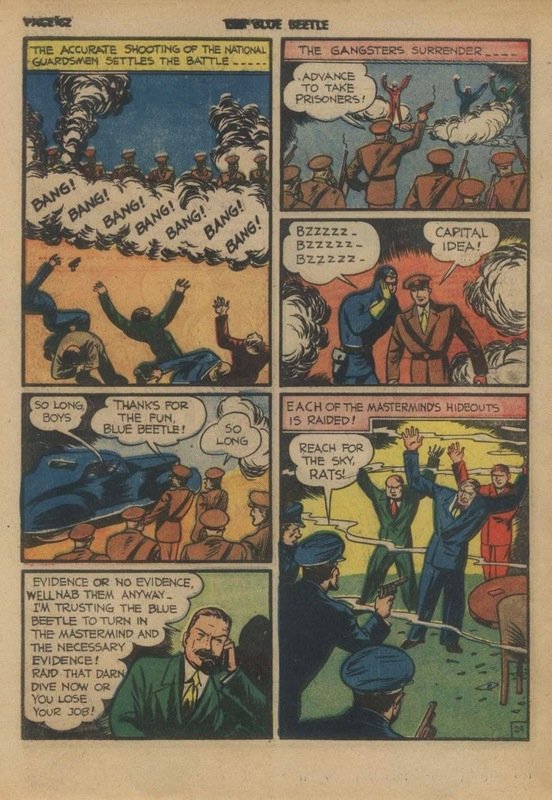 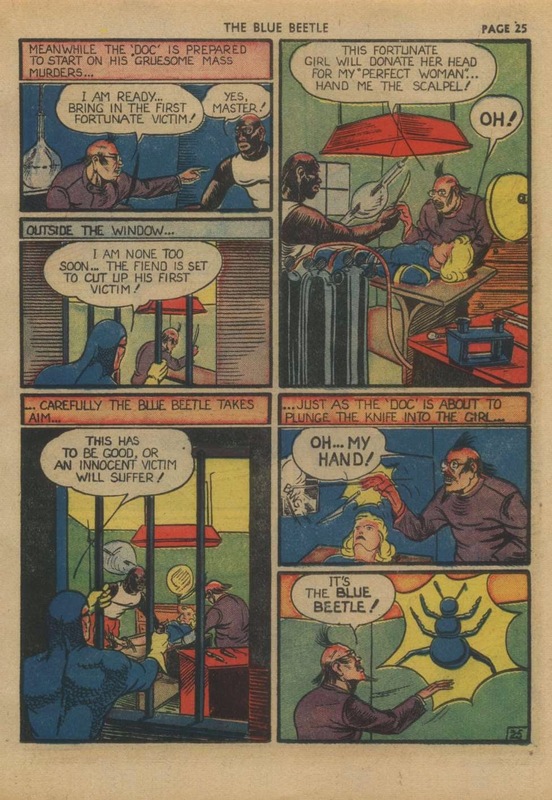 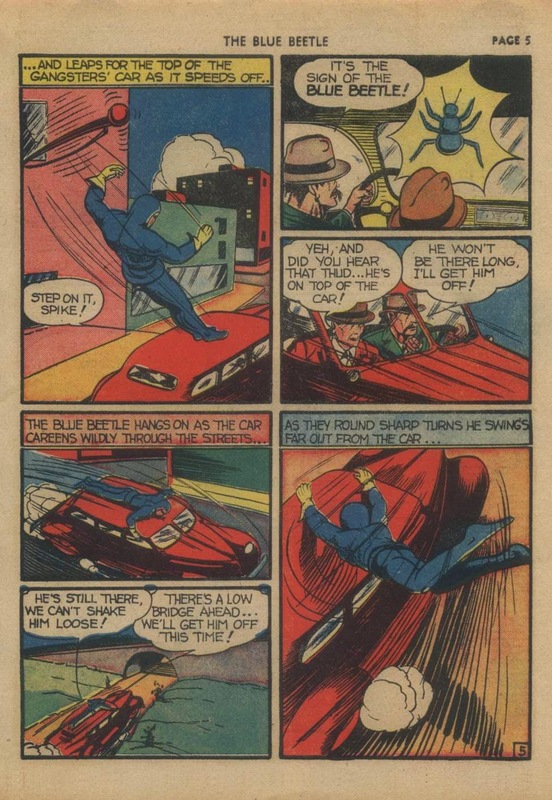 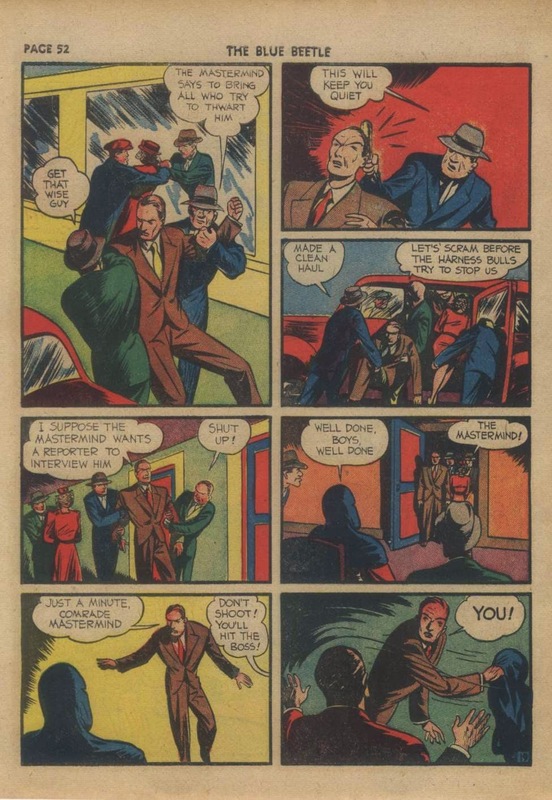 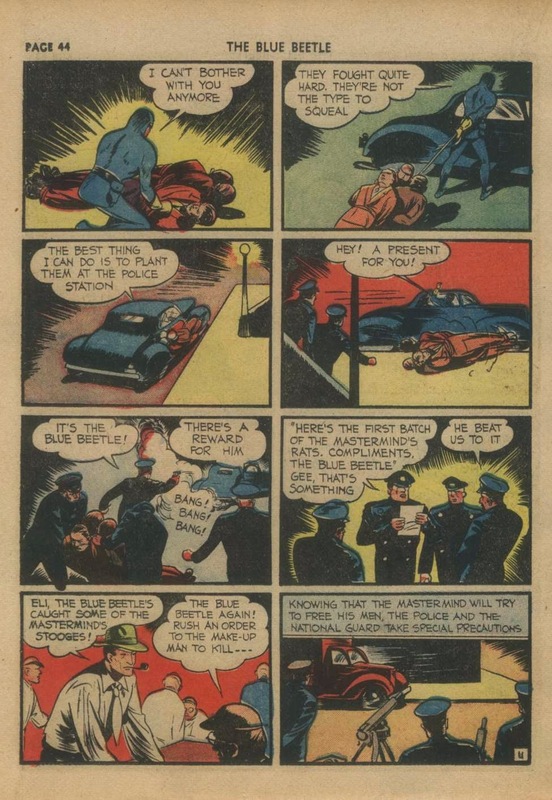 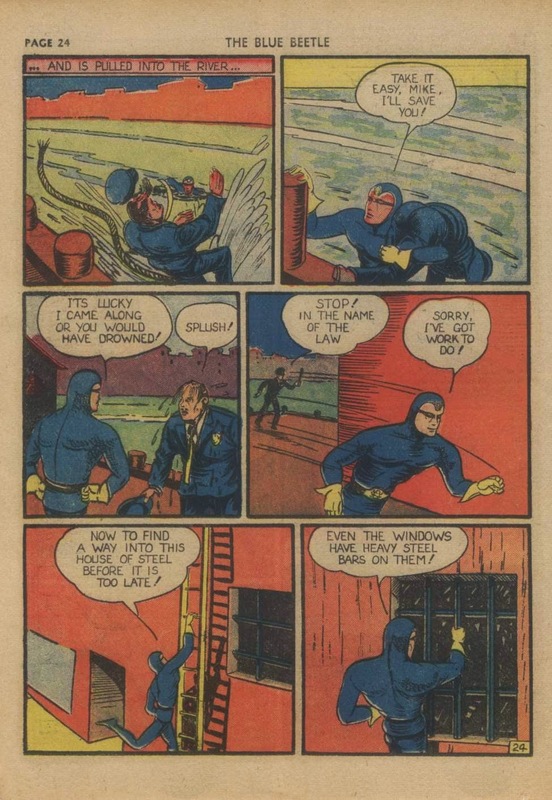 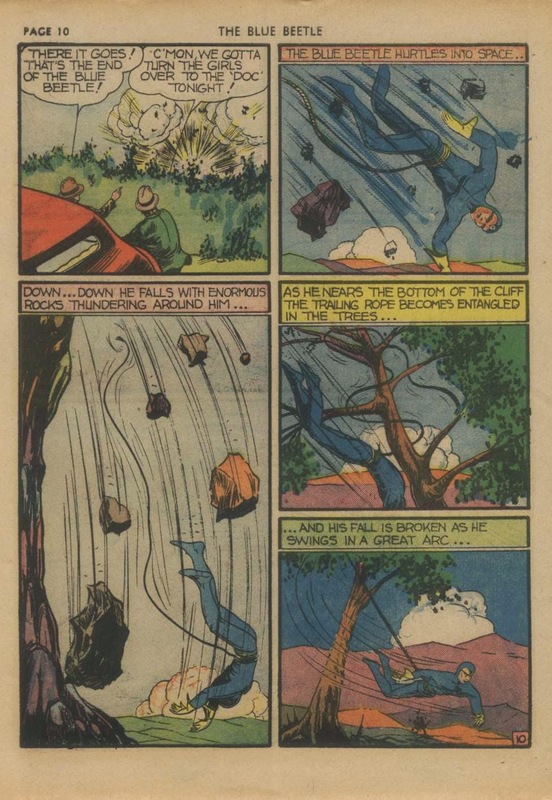 MYSTERY MEN COMICS #13 (August 1940) gives us our first mention of vitamin 2-X, the formula which enhances the Beetle's strength. 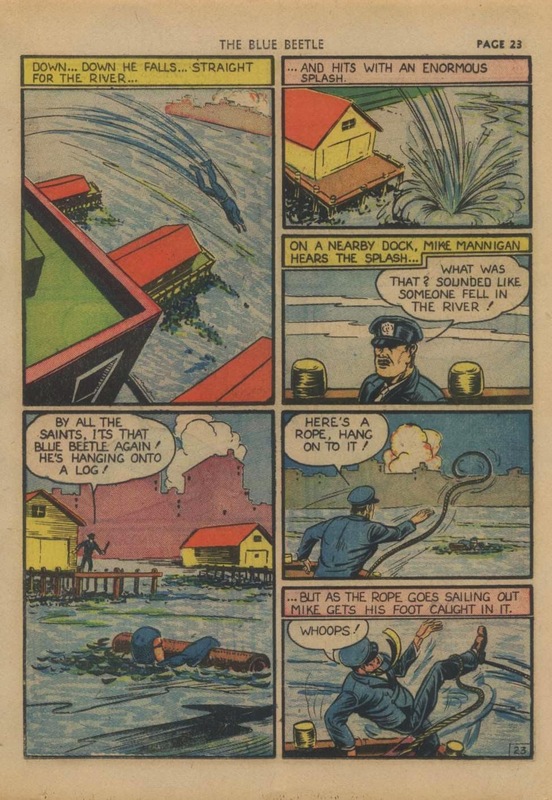 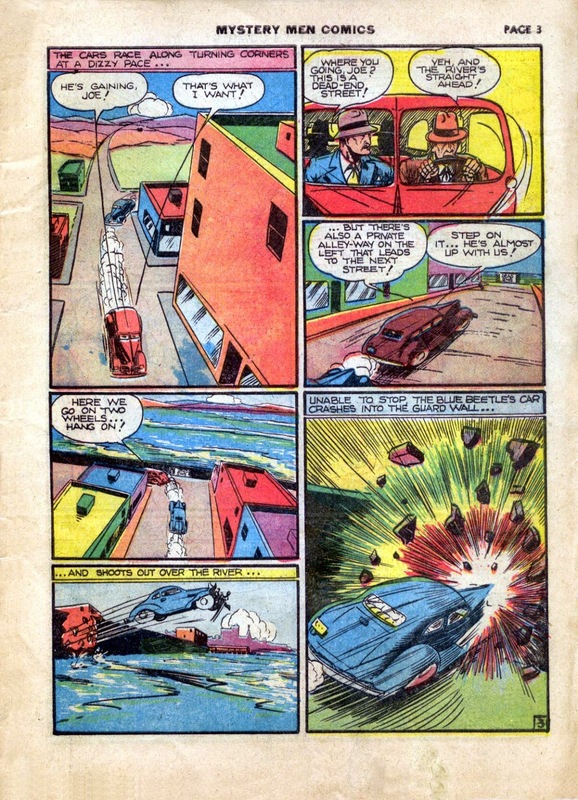 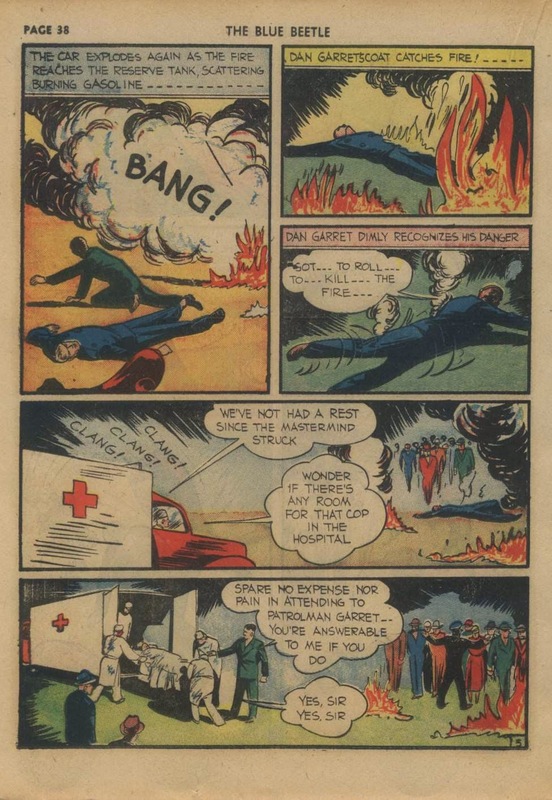 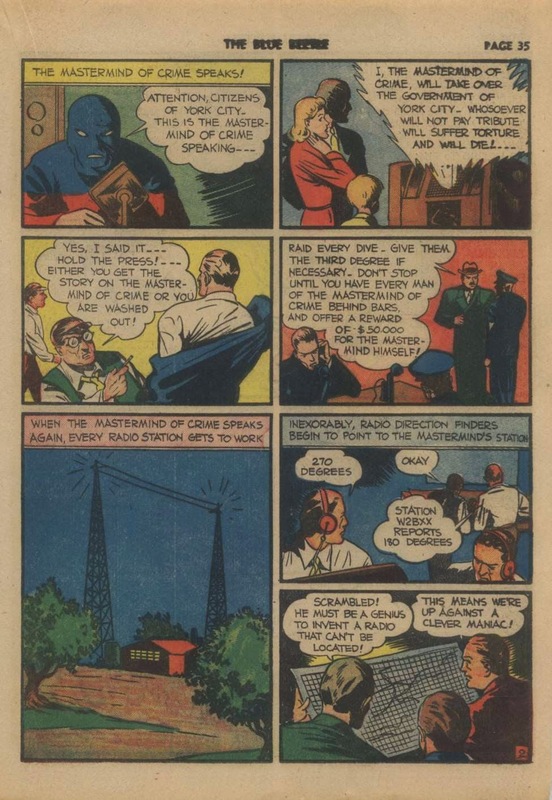 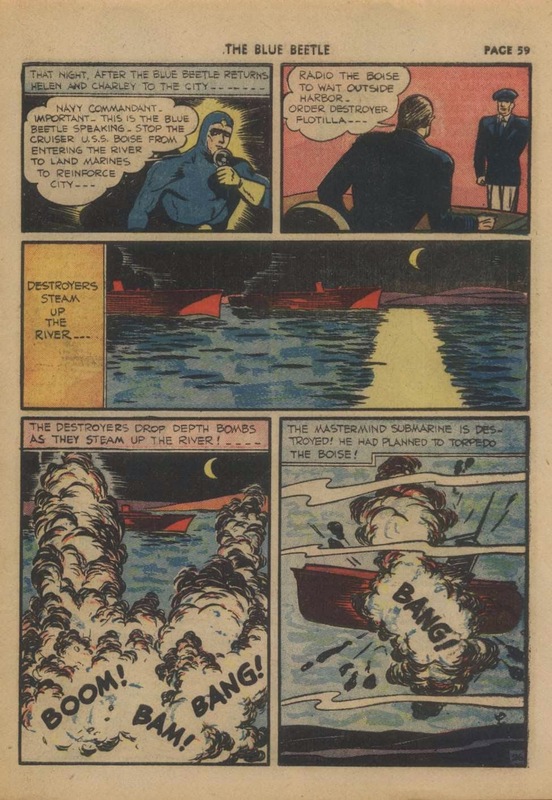 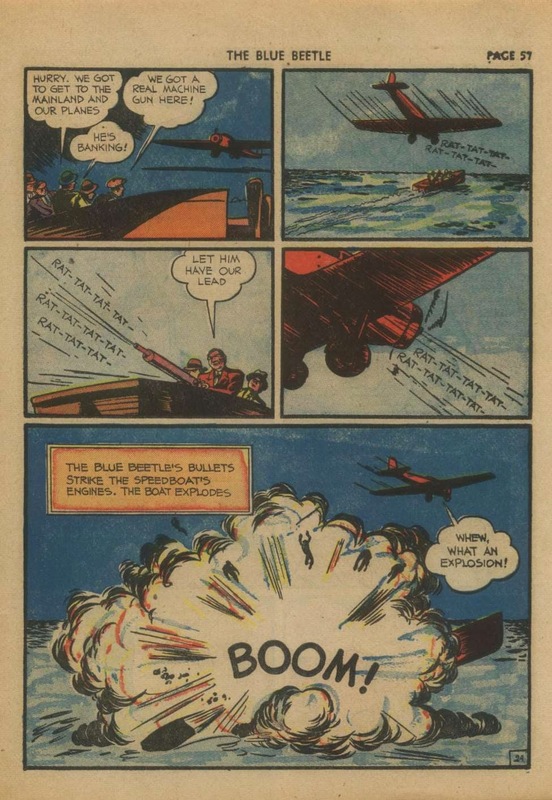 V2X was first mentioned in the radio series, and then carried over to the comics. 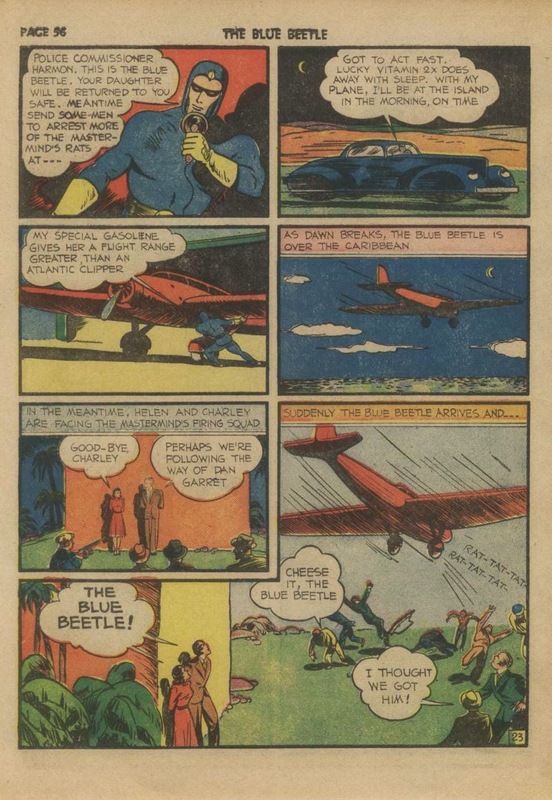 This story is a rather pedestrian entry with, other than the aforementioned V2X, follows the absolute most basic of Beetle formulas. 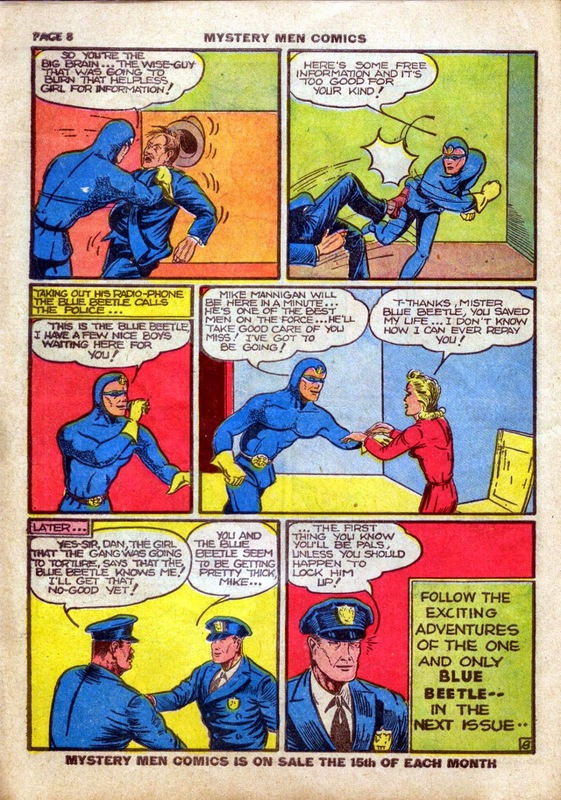 Bad guys want to rob a pawn shop, and are willing to torture a girl for the safe combination. 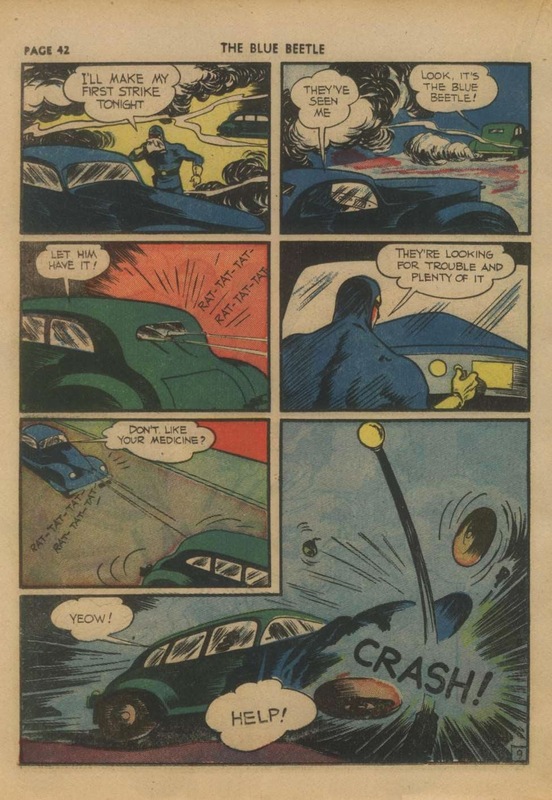 Car chase. 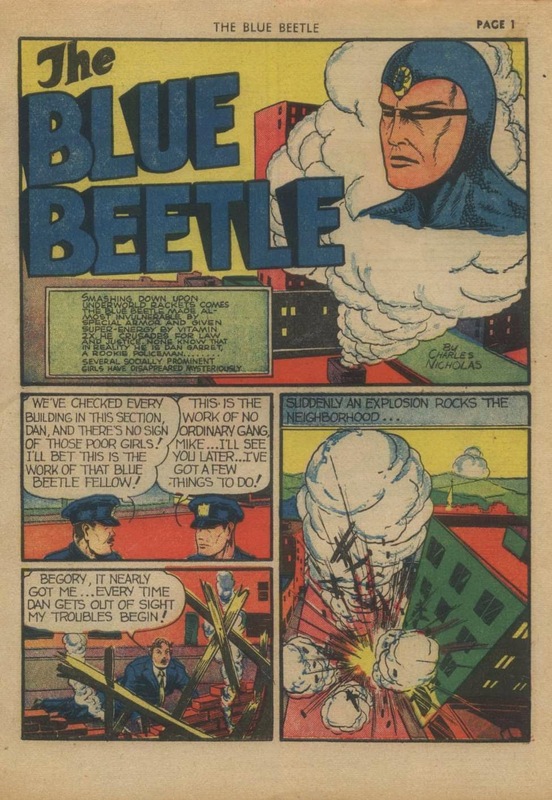 Beetle gets caught in a seemingly life threatening spot. 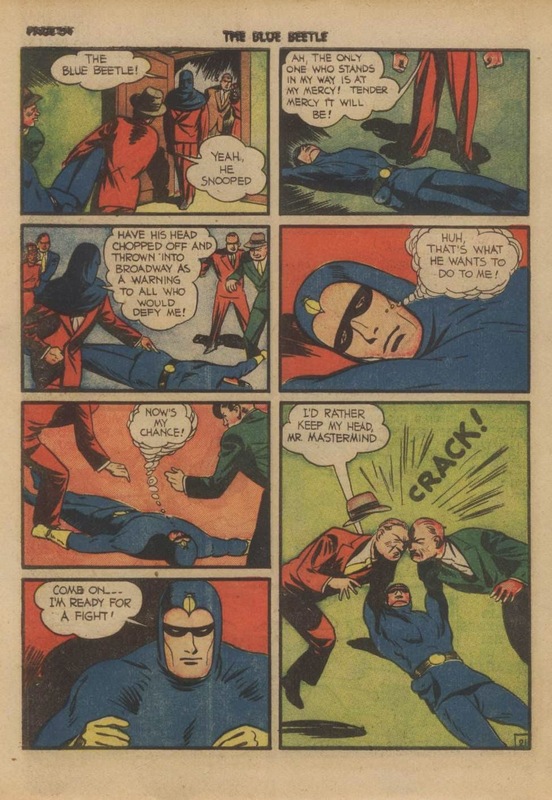 Mannigan gets coshed (but surprisingly Beetle is spared a bonking on the head this time!). 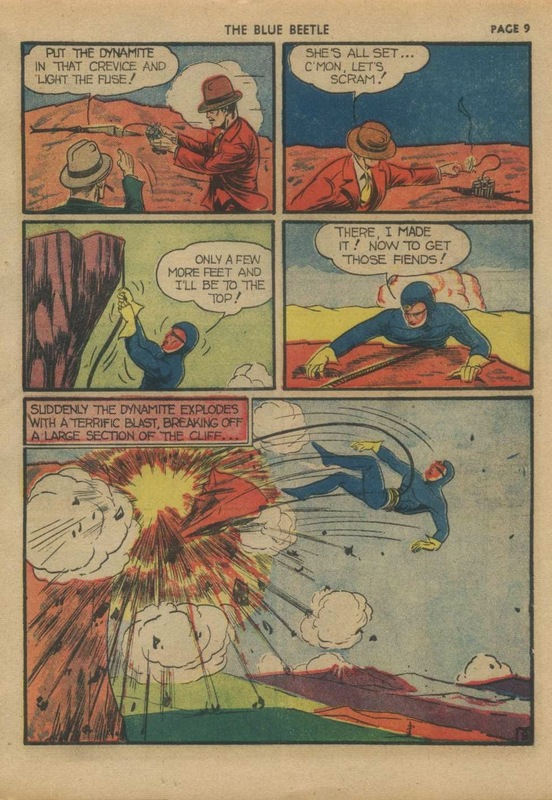 And , of course, at least one explosion. 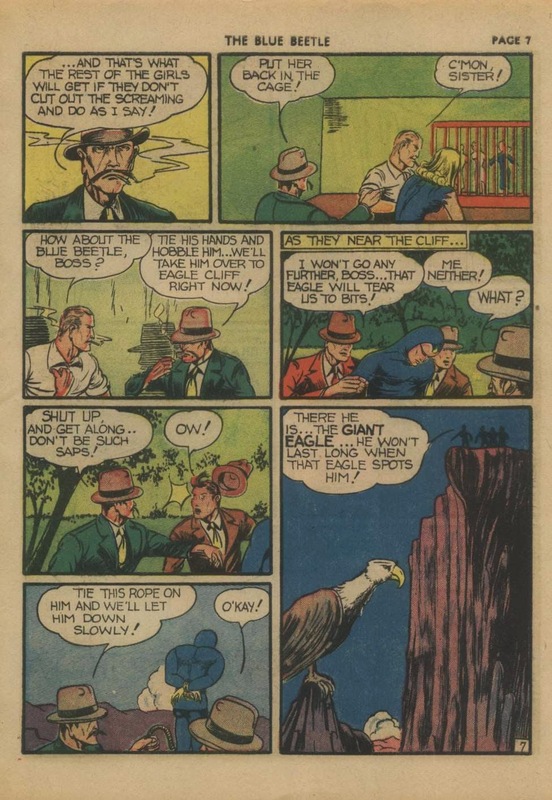 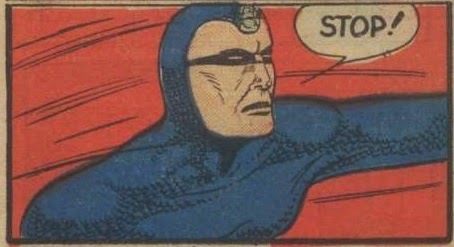 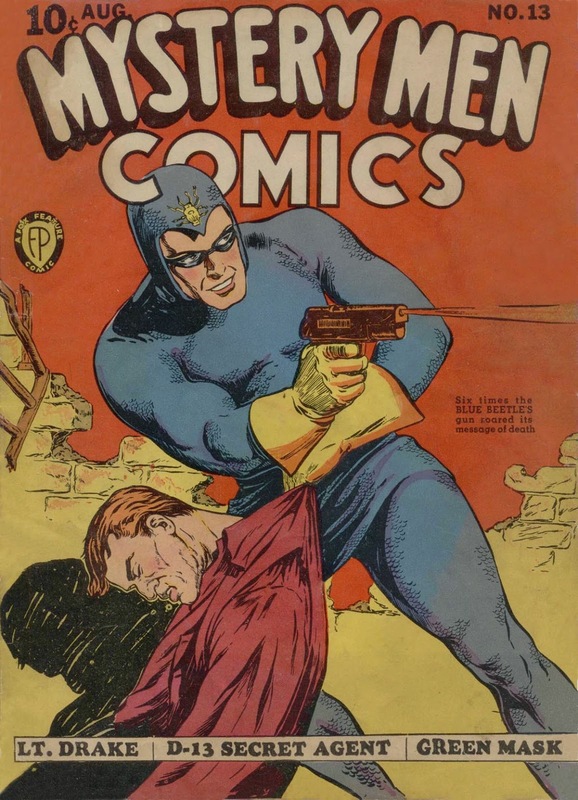 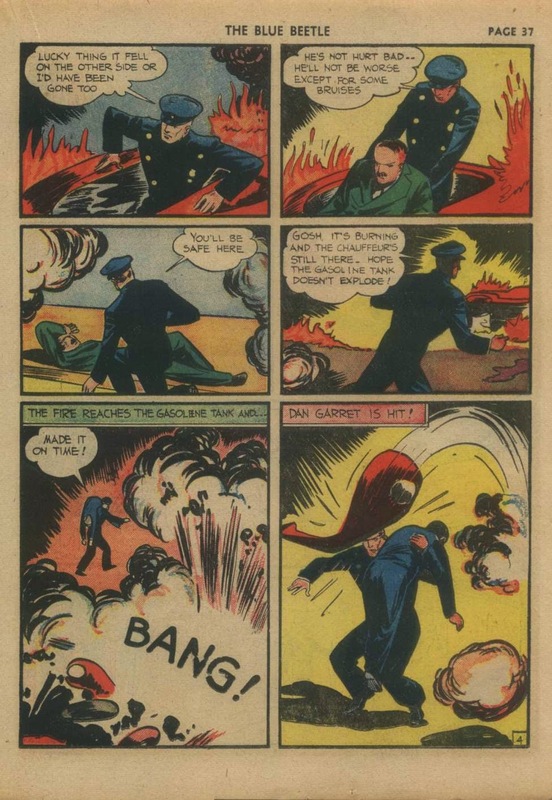 Noteworthy is the use of a handgun on both the cover (by Edd Ashe), and in a single panel in the story. 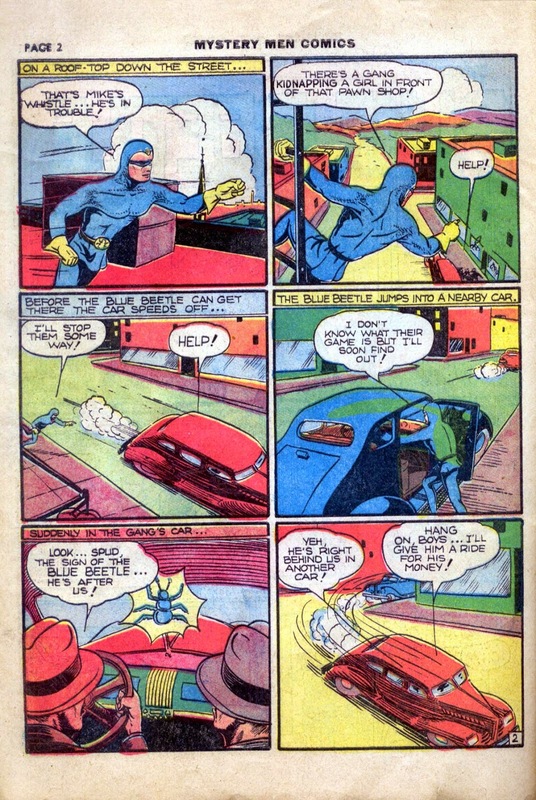 At this point , dealing out violence of the fatal kind to the bad guys is still a viable option for the Beetle. 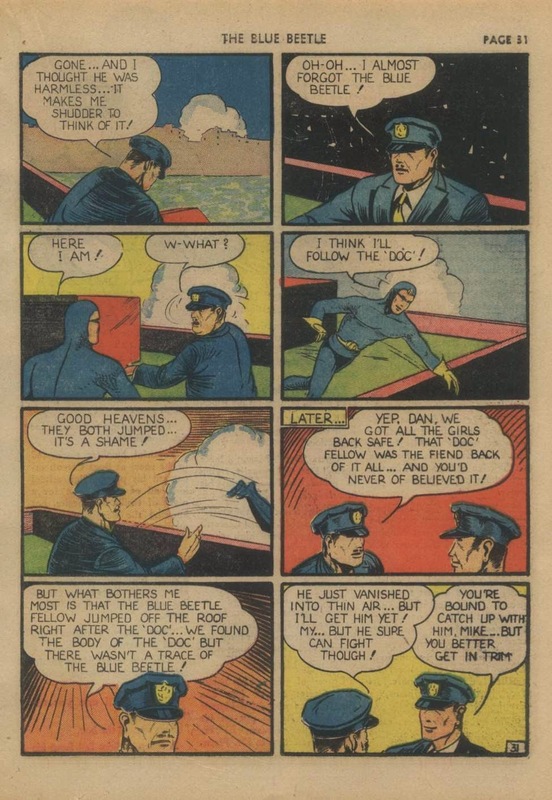 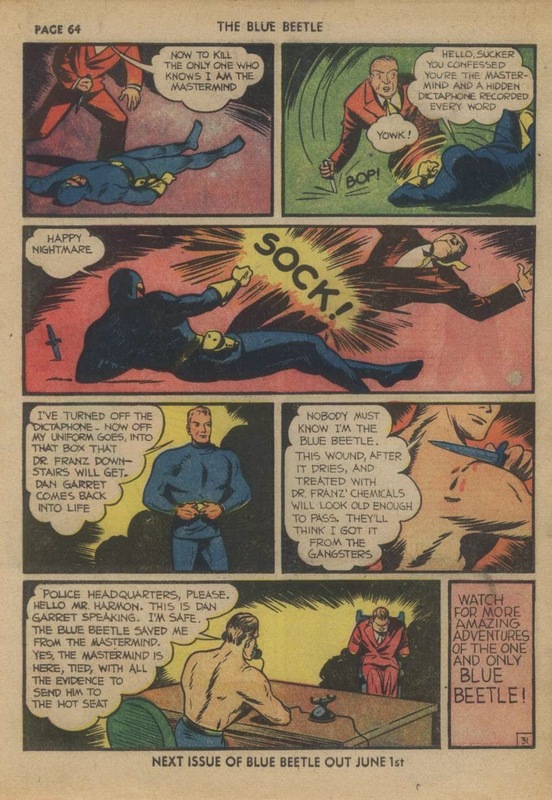 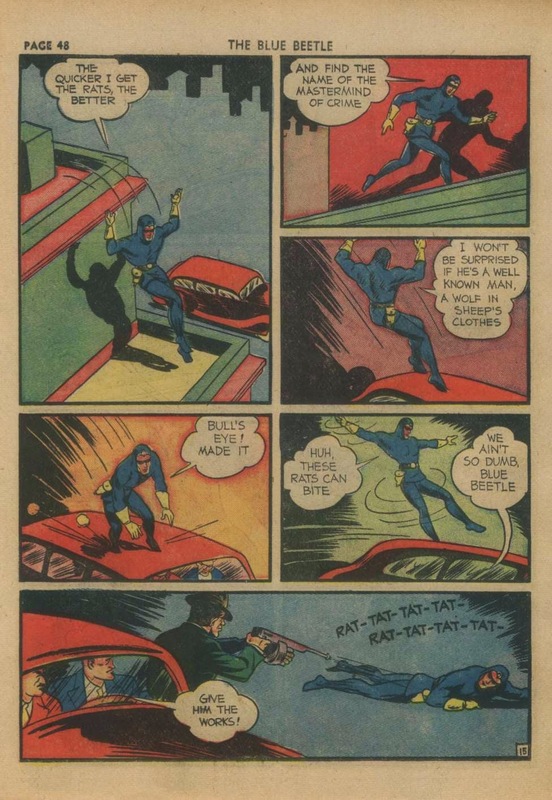 It's a pretty good assumption that he kills the thug on the rooftop of the pawnshop, as well as at least maiming another goon with the automatic pistol. 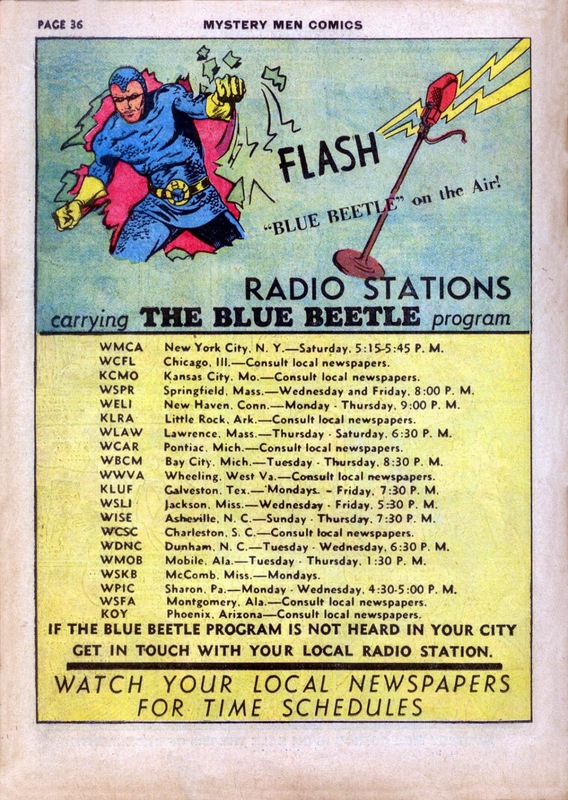 Gadgets this time around include the Beetle Sign, and his mini radio-phone. 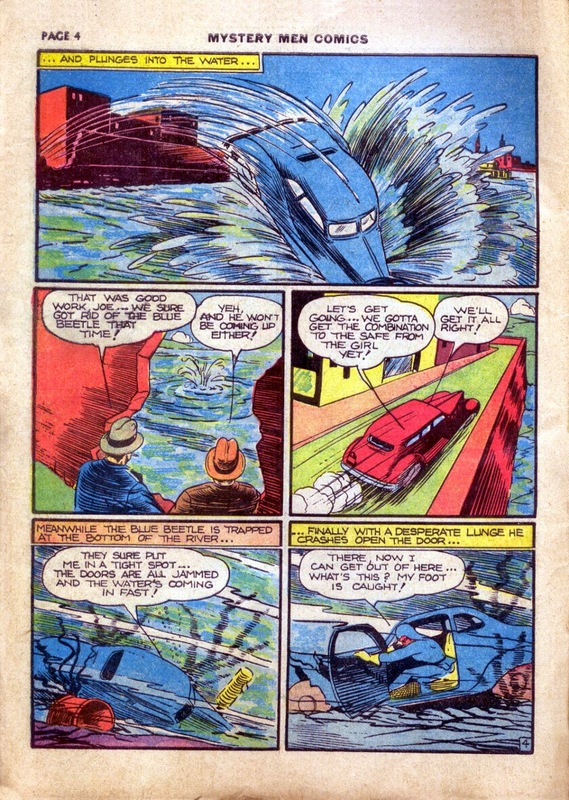 Again, the art is signed by series creator Charles Nicholas, but is in fact by Larry Antonette. 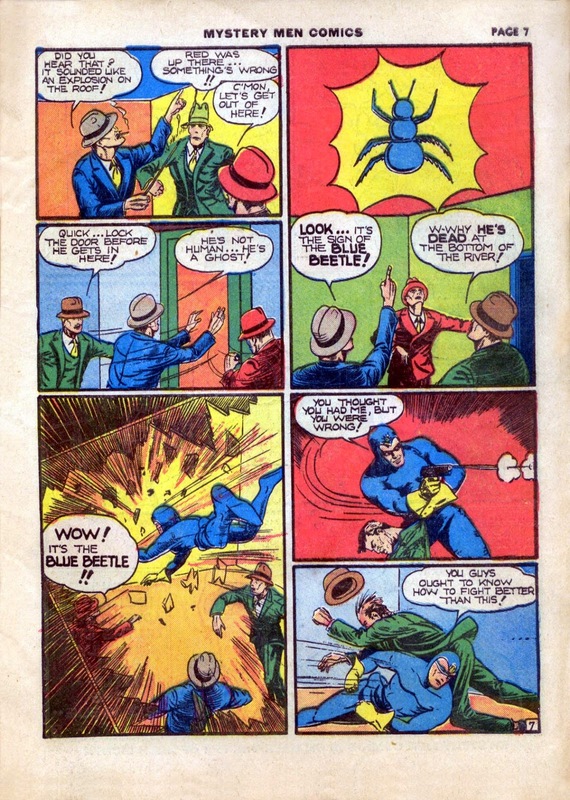 This second epic-length 31 pager from Blue Beetle #3 deals with "the mastermind of crime", another racketeering honcho--only this time he's masked to conceal his true identity. 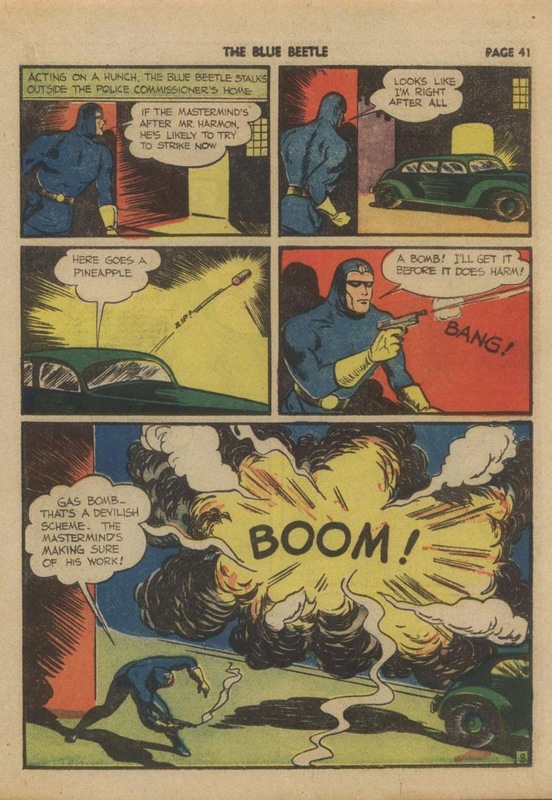 This one has the staple of the series, explosions (and a LOT of them! 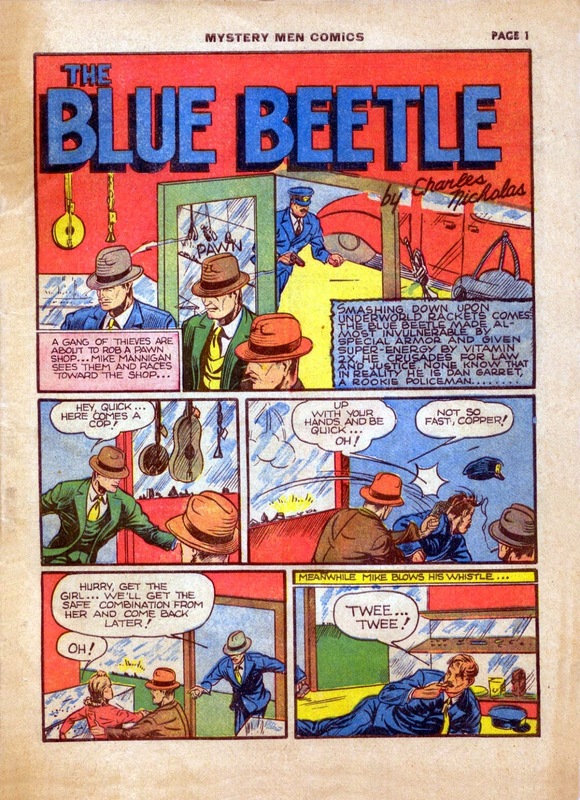 ), thug-fights, the bounty on the Beetle etc. 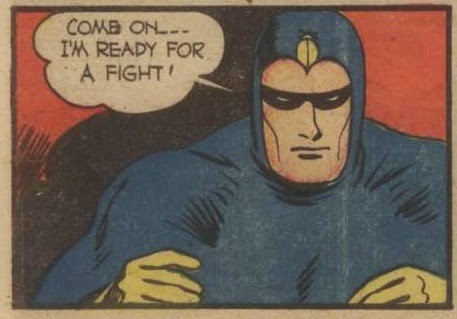 However we get some new stuff as well. 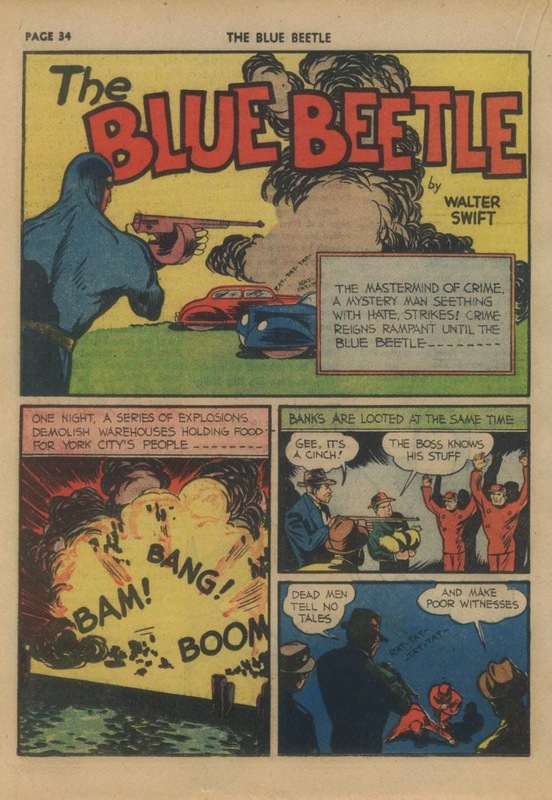 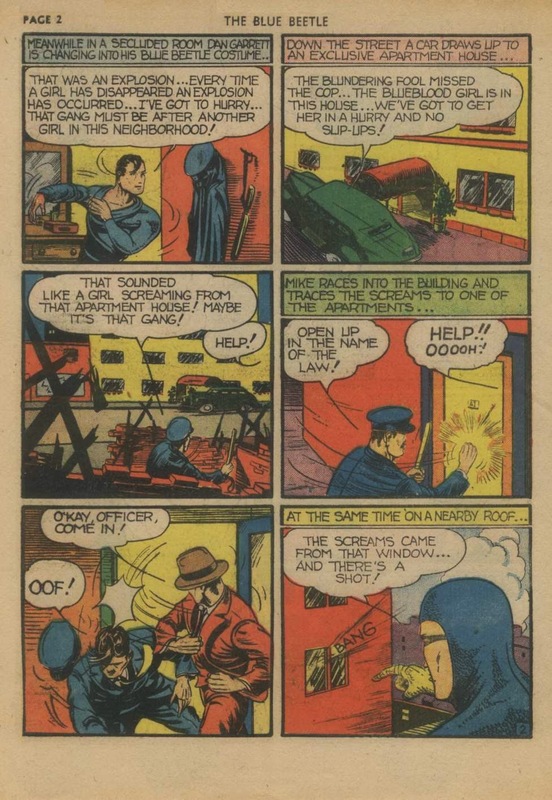 We learn the name of his city (York City), we see his new beetle car in action with it's super strength steel, Beetle uses a gun for a lot of this story and uses it often, even shooting a few thugs. 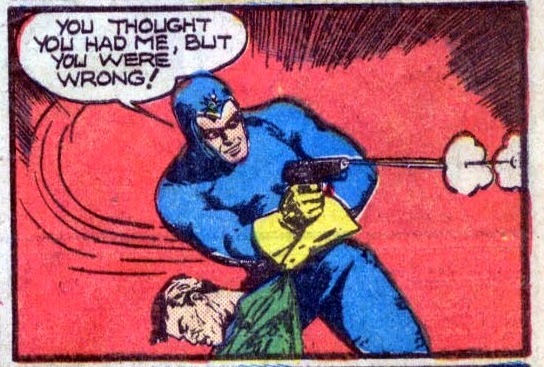 We even see him strap some poor bad guy into an electric chair and threaten to juice him! 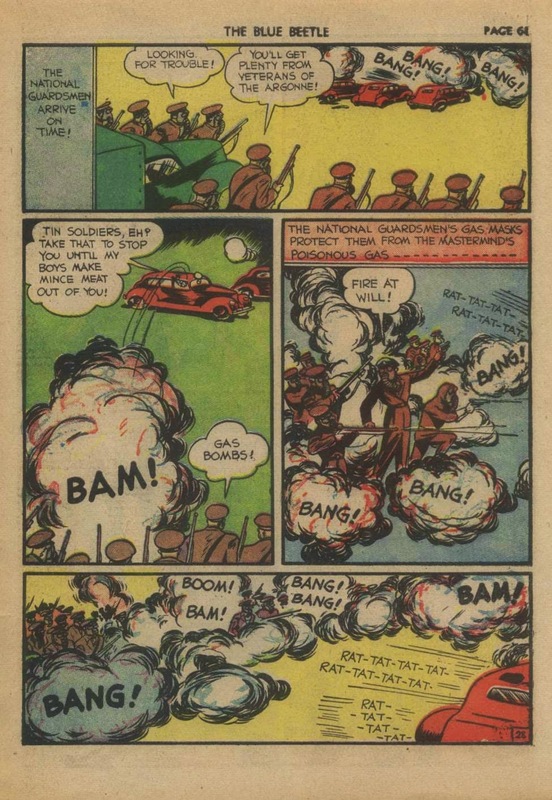 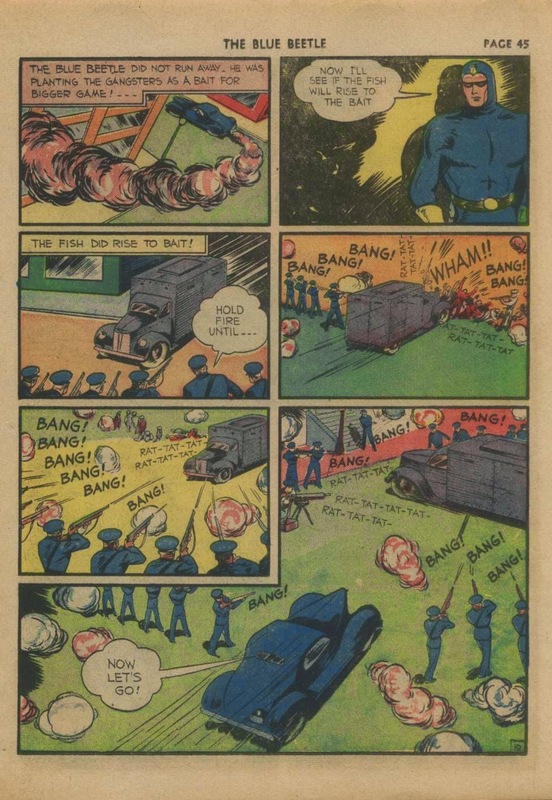 There's an enormous amount of carnage and death in this one, and a lot comnes from the Beetle's own hands! 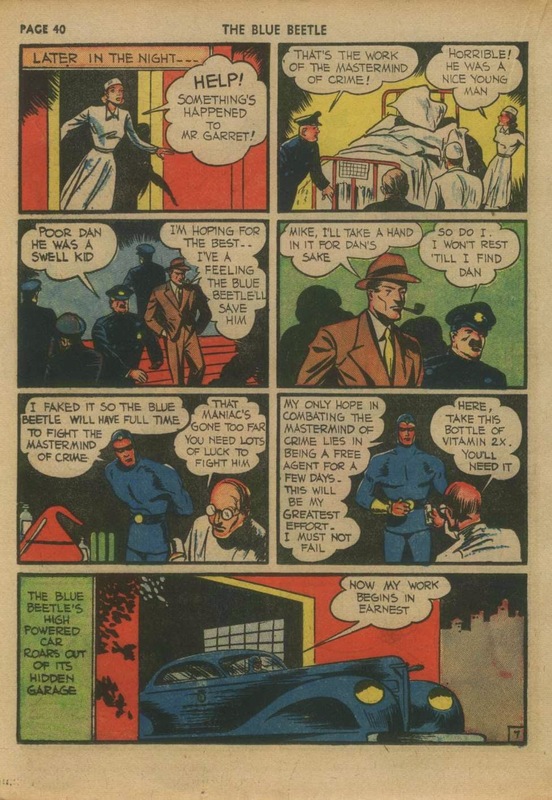 There's a neat little twist at the end that Garret uses to help conceal his alter ego as the Beetle, as well. 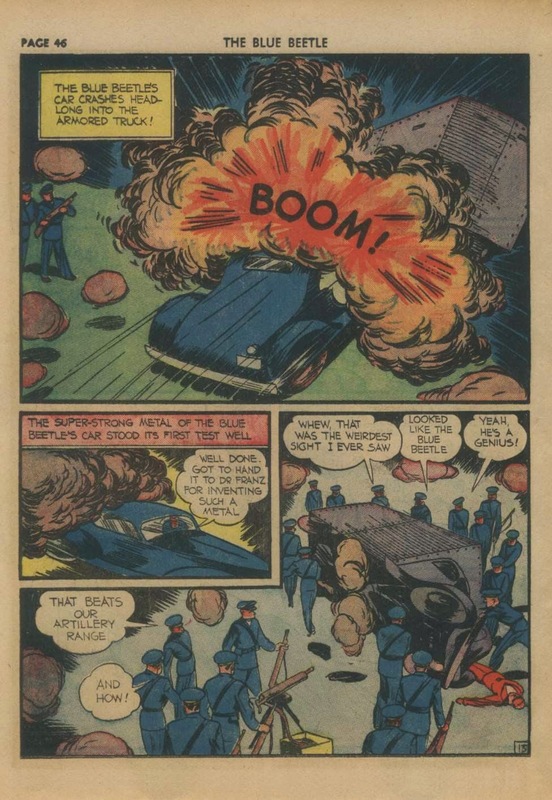 Artwork for the first time is credited to someone other than Charles Nicholas in the splash. 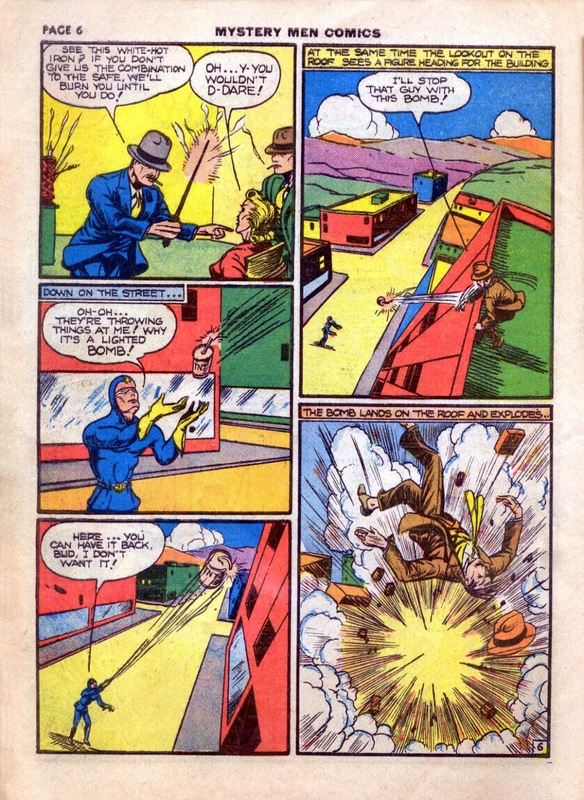 Although the credit is given to a "Walter Swift", it is in fact by Pierce Rice. 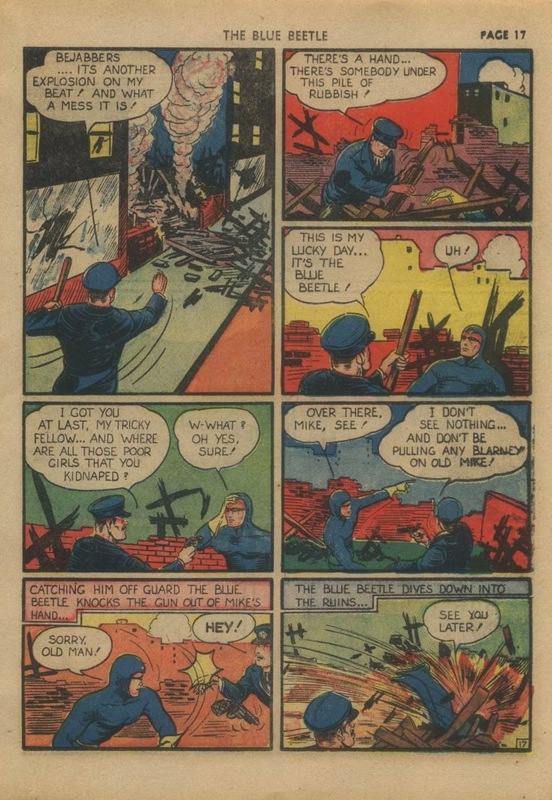 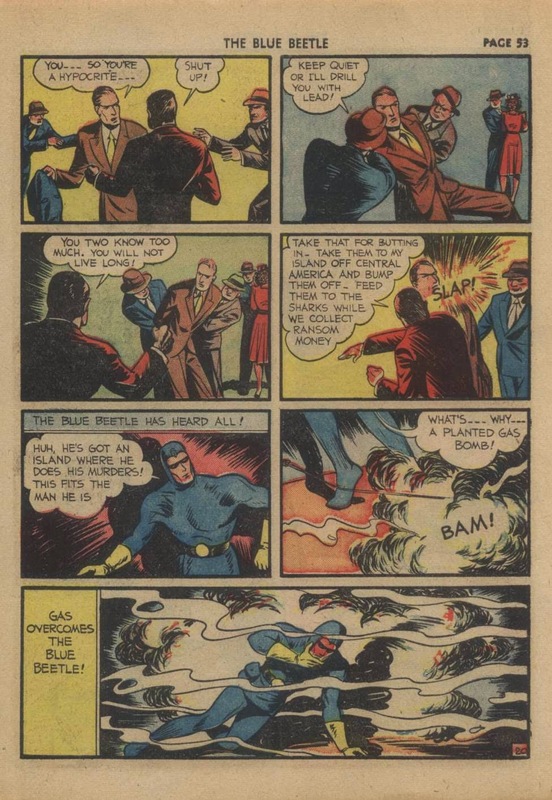 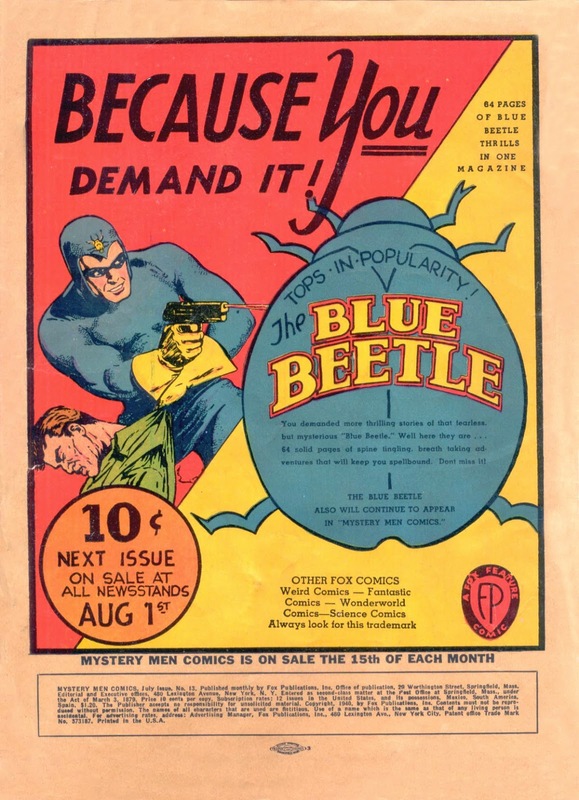 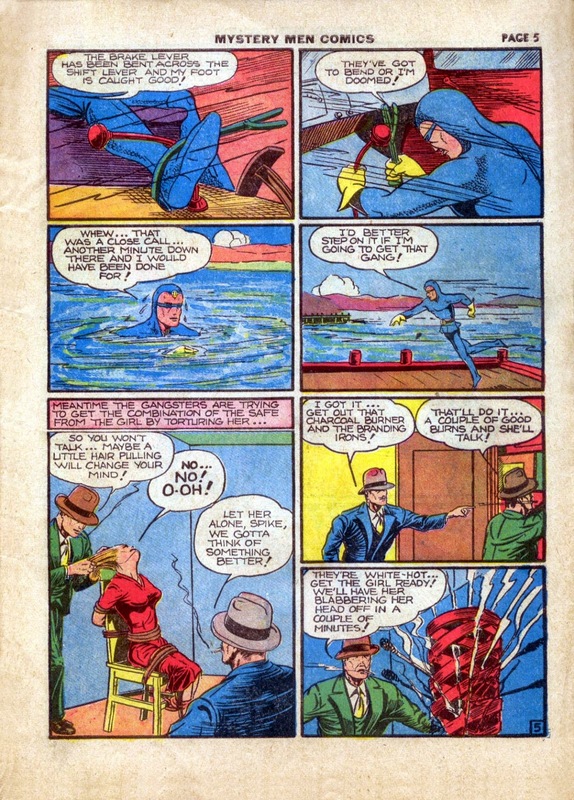 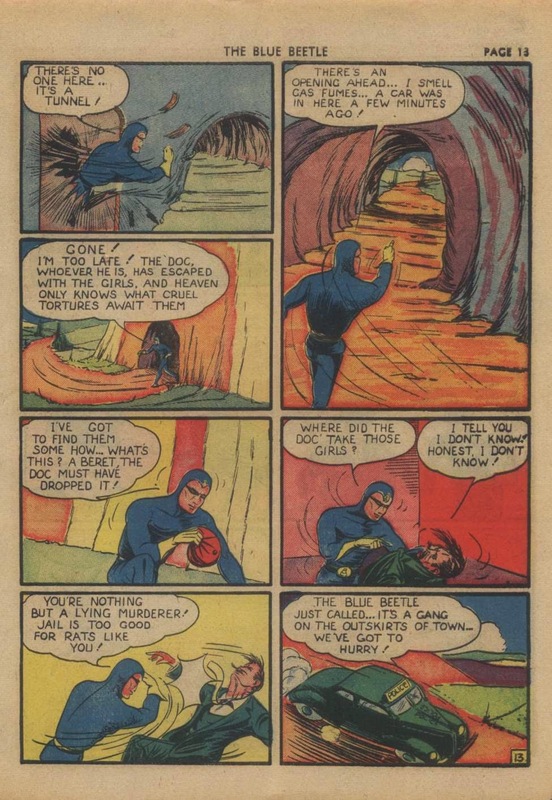 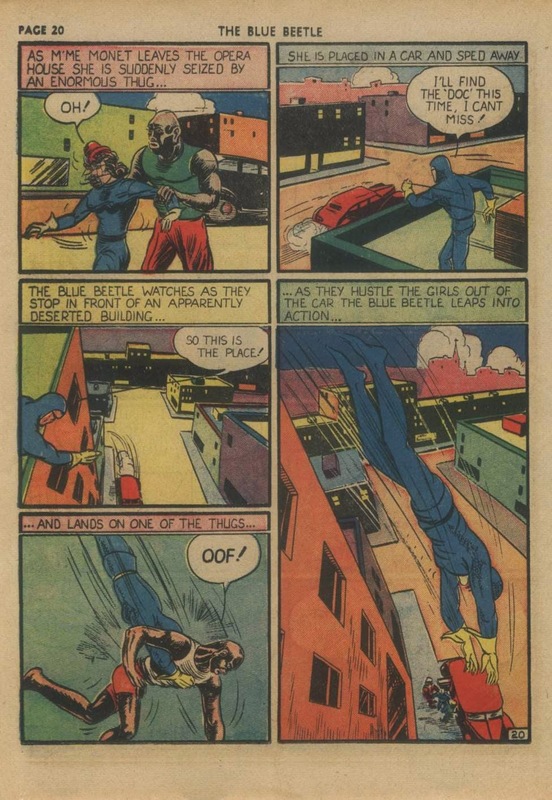 BLUE BEETLE #3, July-August 1940 gives us something bigger and bolder--not one, but two supersized 31 page epic adventures! 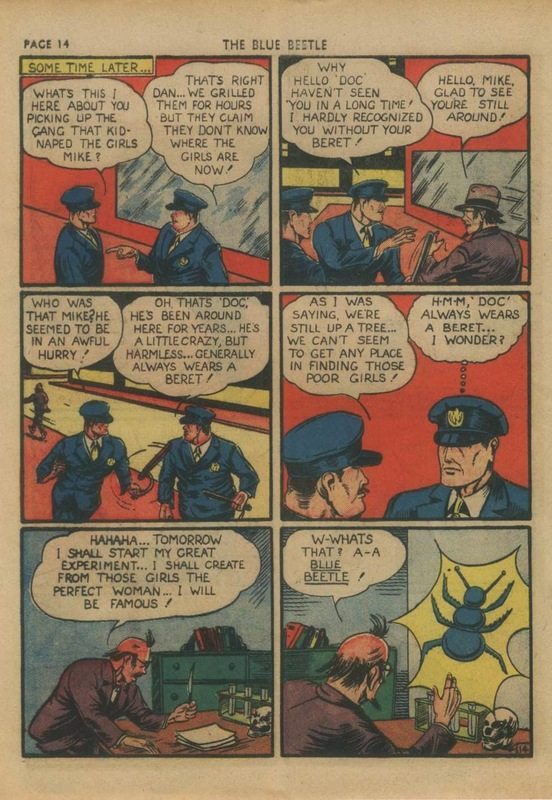 The first is a total bijou b-movie boiler, that concerns the kidnapping of several uppercrust young ladies. 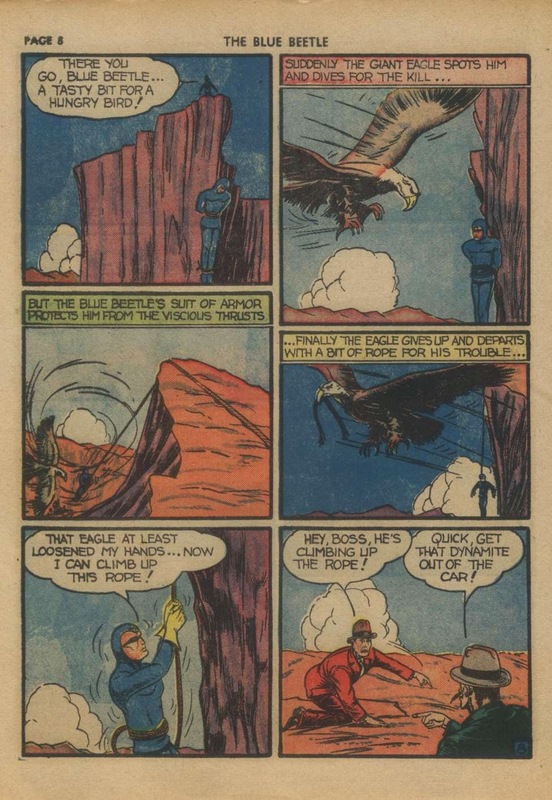 As BB tries to solve the mystery he must first battle the requisite goons, and escape from the always-present explosions that seem to be happening in every story--not to mention a giant eagle that wants to pick his bones clean! 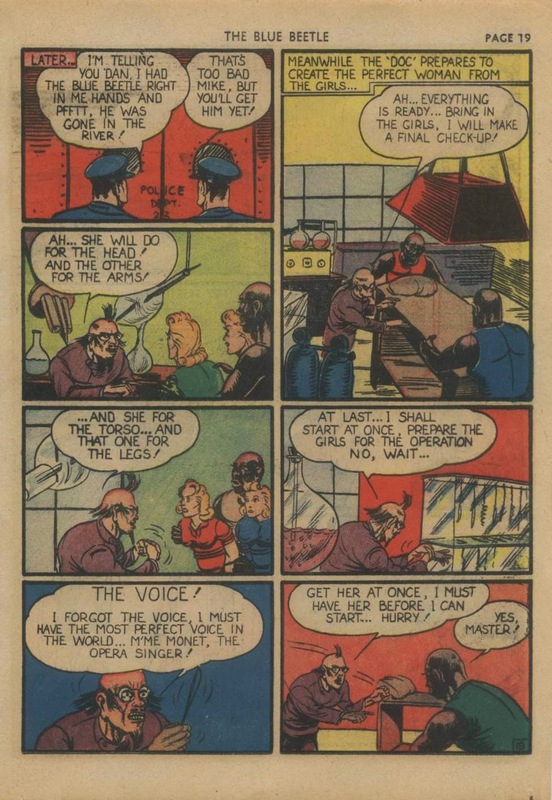 The villian here is named only as "Doc", and it seems he wants to cut these poor girls up (after a good lashing with a whip) and assemble their best parts into his perfect woman. 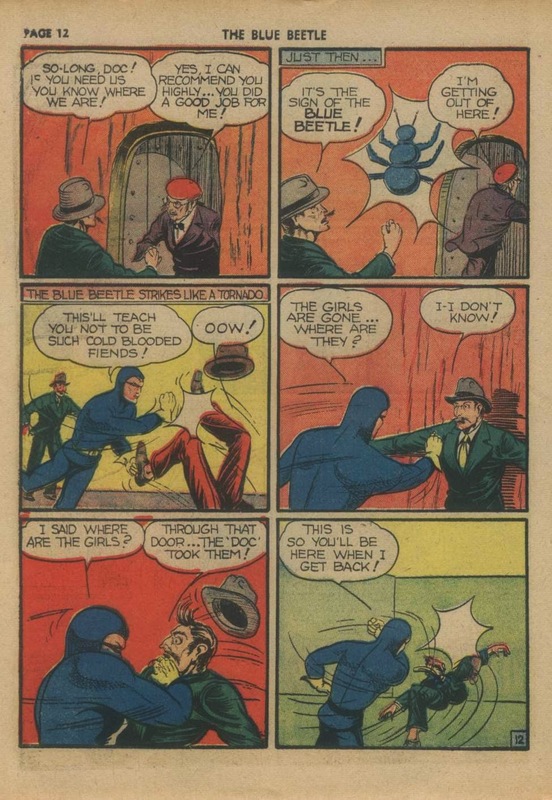 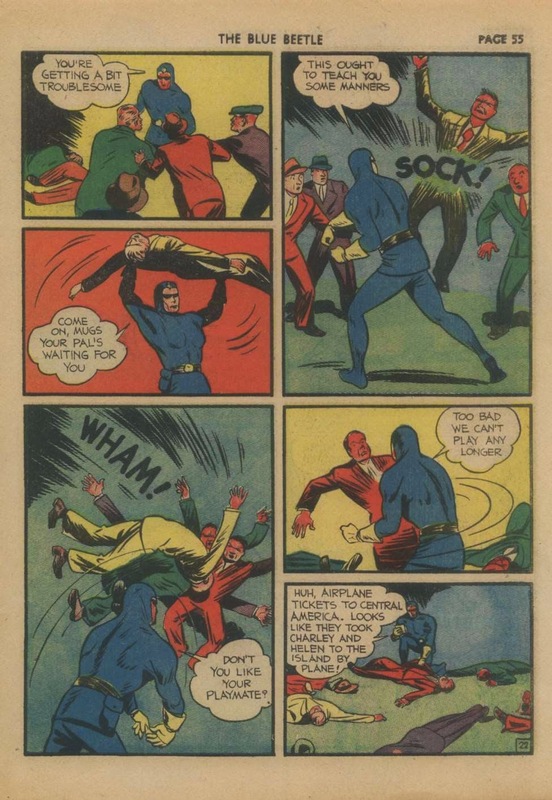 The Beetle must fight off a squad of "giant thugs" (which ,although unspoken, appear to be creations of Doc), and the ever-bumbling meddling of Mannigan as he gets ever closer to rescuing the girls. 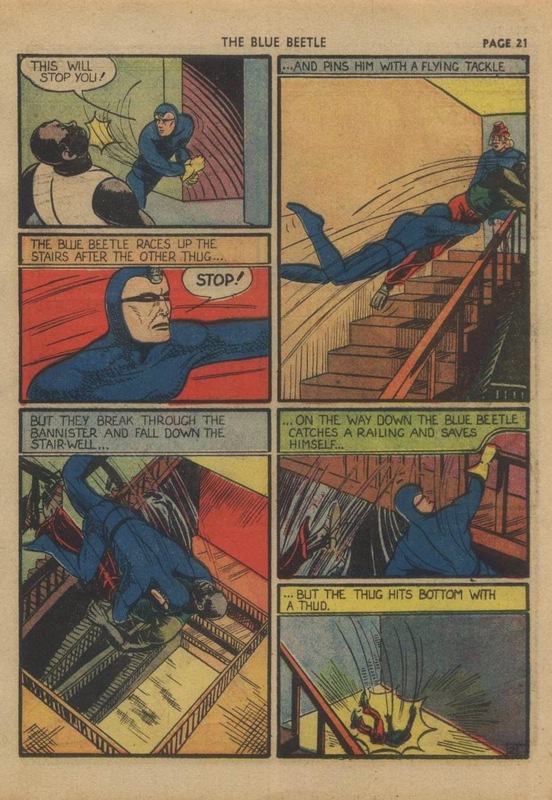 Mannigan, himself, gets an enormous amount of story time , getting close to catching BB several times, although his clumsiness is his downfall as usual. 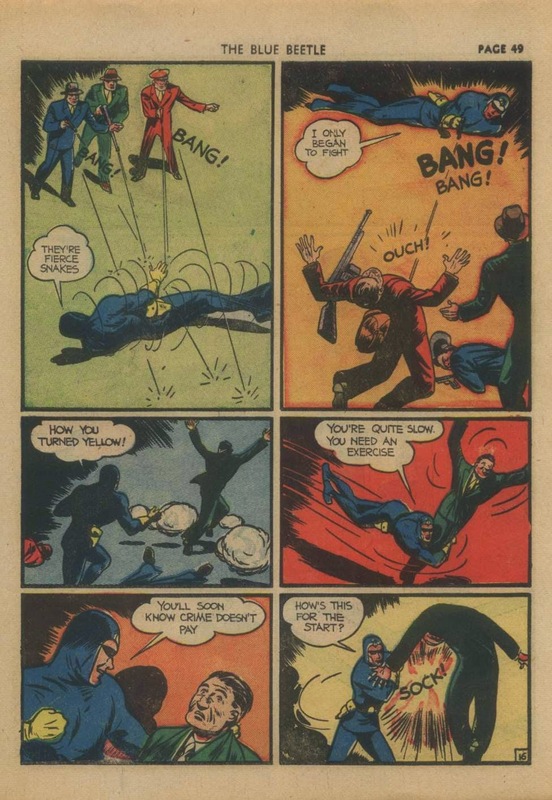 The art in this story appears to be by either Tony Antonette or Pierce Rice --or possibly both.